Notice how I have deleted the Freezer part out of the title? That’s because this blog is(Part 8.) not just about Manton’s Freezer trucks. For those of you who don’t know or haven’t read the previous 7 parts. 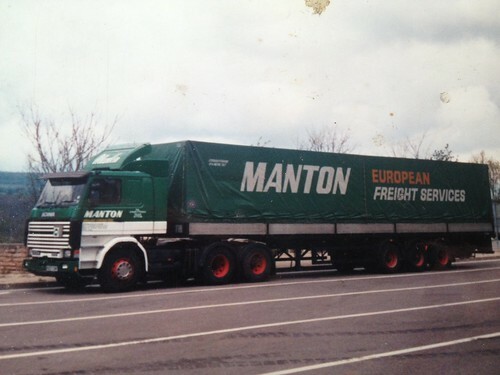 Manton’s were a family firm from Yorkshire who ran a very smart fleet of mainly Scania’s across Europe delivering all types of egg product’s, mainly in frozen powder form. If you search in the search bar to the right for Manton, you should bring up the previous blog’s. This particular part of the series is a bit of a bumper edition. 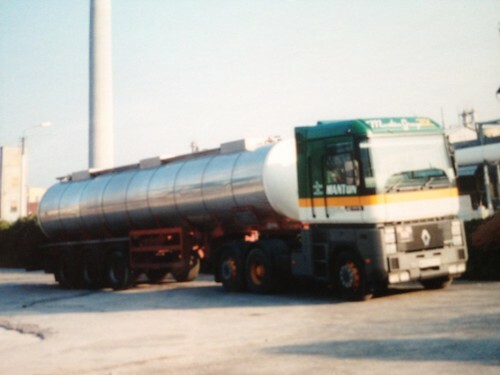 Starting with the elusive and rather fetching Renault Magnum……. One thing I have not asked Mr Manton is whether this Magnum was the one and only on the fleet? Can you help? I know there was a Magnum, but by the serious lack of photographic evidence, there can’t have been more than a few if that. From the photo we can see it is an “M” reg which means it was new in 1994, according to the DVLA it was first registered on 8th August 1994 and it has not been taxed since 31st November 2006. I have no idea what horse power it was although 385hp were popular I think a 4? ?hp of some sort would be more likely. The other interesting thing about this truck is it’s a Tag axle. This makes it really quite a rare beast, not just for Manton, but in general. If you know any more about this truck in Manton guise or in it’s afterlife if it had one, please email me or leave a comment. This photo was taken in Spain or Italy. Another photo of the Magnum, pulling a tanker, a surprise to me too! I had no idea that there was a tanker fleet too. Mr Manton tell’s me; “The tankers were carrying liquid egg to North Italy, then we used to reload apple juice ex Gleisdorf in Austria to Bridgewater“. Below is another photo of one of the tanker fleet. This time a very tidy 20ft tank-tainer on a 30ft skelly trailer being pulled by a twin wheel tag axle flat top 3 series Scania. Brilliant. The next photo is of a 143 and a 113 Scania loading fruit in Southern Spain for the UK. Next up a classic trio of V8’s waiting to leave the UK for sunnier shores. What a line up! How on earth would you pick which one of the 3 legendary V8’s you’d want to drive for a run to the sun?! Mr Manton said; “I found out where the 3 truck’s were….. Plymouth!! All waiting to ship out to Santander, loaded with seed potatoes from Scotland, for delivery to McCains factory in Burgos, Spain. 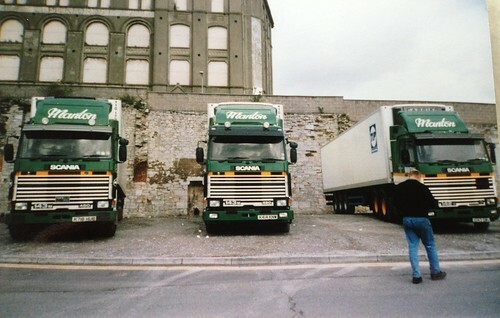 We did a lot of these, and on arrival at the factory, you were then sent to 3 or 4 deliveries to farms around N.Spain.” The 143 Topline Scania in the middle, K414 KNW, is actually the truck that started this whole 8-Part-and-counting story. 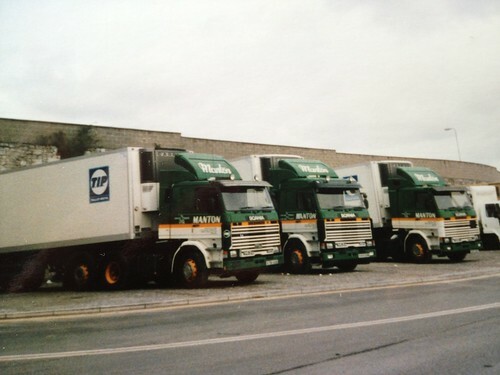 I spotted this truck in the 1990’s on my local Industrial Estate in Braintree, Essex. To read Part 1 of the story just click HERE. Thanks to Dave Manton for his continued photo hunt for us all to enjoy. Hopefully the story will continue, so if you have anything to add please email me; ben@truckblog.co.uk or leave a comment. 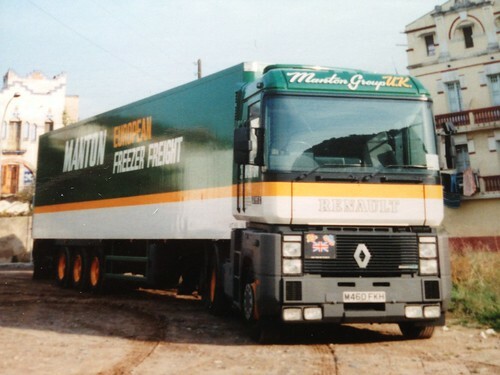 Also do you know of and ex Manton driver by the name of Graham “Walter” Lavington? I am reliably told he has a huge collection of Manton photo’s!! 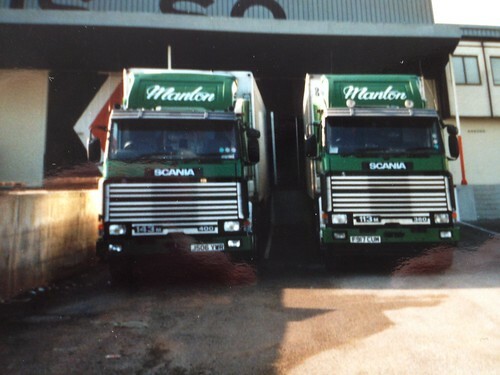 This entry was posted in Golden Oldies, International Mega Trucking, Photos, Renault, Scania by truckbloguk. Bookmark the permalink. 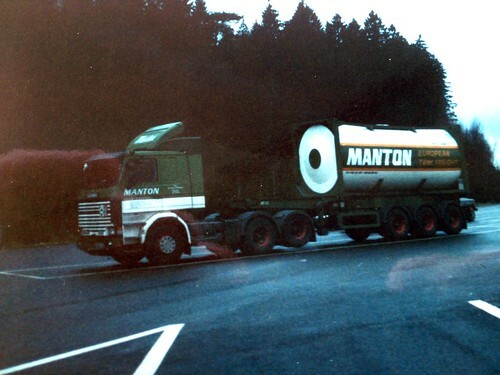 looking through these Manton pics, it appears that only 1 of the 143’s was a topline, which seems quite surprising for a firm doing alot of international work, any ideas why that might be?